Start and finish is on Črne njive, above Ilirska Bistrica. The course follows a diverse terrain on a solid macadam road, among tall pine trees, and blooming karstic meadows. The course which begins with an ascent, and ends in a descent, passes by the foot of the picturesque Milanja ridge, also known as Volovja reber. You are invited to run among the colourful flowers of the karstic meadows. The children’s, and youth route goes around the main area in Črne njive. The length varies from 300 m to 1000 m, depending on the age category of the participants. All courses run in flat terrain, the highest ascent is 20 m on the 1000 m long track. Start at 12:00. Participants in the children’s, and youth runs, as well as in the fun obstacle course for pre-school children, run exclusively at the responsibility of their parents, carers and/ or their trainers. In open category the run counts as event under »Primorski pokalni tek« and »Notranjski tekaški pokal« in cups. 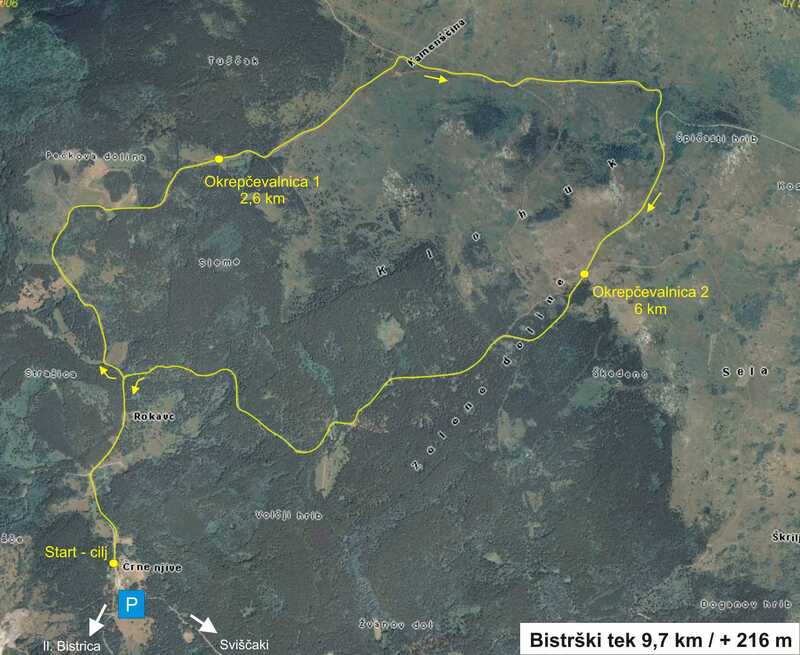 Youth run counts as event (only) under »Notranjski tekaški pokal« cup. The categories of »Primorski pokalni tek« are described here. 1st, 2nd, and 3rd place in each membership category will receive medals, the best overall times in the adult male, and female runs will receive a trophy and memorial gift. 1st, 2nd, and 3rd place, in the children’s, and youth runs, will receive medals.